Dubai: Some travellers booking economy-cabin tickets with Emirates will still enjoy up to 35 or 46 kilos of baggage this year. 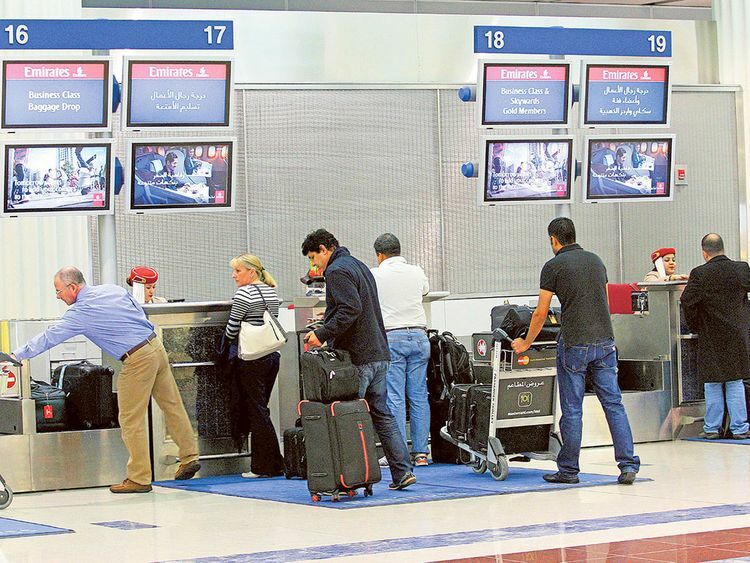 The UAE-based carrier confirmed on Monday that the baggage allowance cuts that will take effect from February 4 will not apply to all seats in the low-priced categories. Some passengers, including those who book flights within the Americas and between United States and Europe can still travel with two pieces of luggage weighing up to 23 kilos each. “Depending on the choice of fare type, Emirates’ economy-class passengers can still enjoy up to 35 kilos, or two pieces of 23 kilos, of free baggage allowance,” a spokesperson told Gulf News. Members of the airline’s Skywards loyalty programme will also continue to enjoy additional baggage benefits. The airline announced earlier that the limits for bags in the “Special” and “Saver” categories will be reduced by five kilograms. The new policy will be rolled out on February 4 and impact travellers who will book tickets to any destination, with the exception of those who are bound to the Americas and travelling from Africa. “After a careful review of customer feedback and their travel preferences, Emirates can confirm that we will be updating our standard free baggage allowance for Economy Class travel, effective for bookings made on or after 4th February 2019,” the airline said in a statement. Emirates’ economy-class cabins have different seat categories: Flex, Flex Plus, Saver and Special. The allowance for “Special” will drop from 20 kilos to 15 kilos, while the limit for “Saver” will be cut from 30 kilos to 25 kilos. Weight allowances for “Flex” and “Flex Plus” will remain the same at 30 kilos and 35 kilos, respectively. The airline would not specify what percentage of the economy-class flyers will be affected by the new policy, citing that it’s a “commercially-sensitive” matter. For flights within the Americas and between US and Europe, “Special” and “Saver” flyers will get to carry one piece of bag weighing up to 23 kilos, while those in the “Flex” and “Flex Plus+” categories can have two pieces up to 23 kilos each.